Prostaglandin-I synthase (EC 5.3.99.4) also known as prostaglandin I2 (prostacyclin) synthase (PTGIS) or CYP8A1 is an enzyme involved in prostanoid biosynthesis that in humans is encoded by the PTGIS gene. 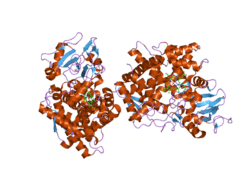 This enzyme belongs to the family of cytochrome P450 isomerases. 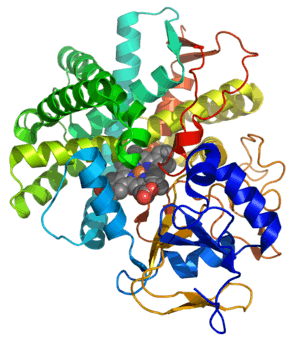 This gene encodes a member of the cytochrome P450 superfamily of enzymes. The cytochrome P450 proteins are monooxygenases which catalyze many reactions involved in drug metabolism and synthesis of cholesterol, steroids and other lipids. However, this protein is considered a member of the cytochrome P450 superfamily on the basis of sequence similarity rather than functional similarity. 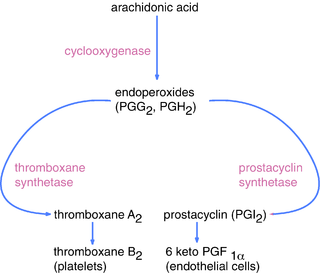 This endoplasmic reticulum membrane protein catalyzes the conversion of prostaglandin H2 to prostacyclin (prostaglandin I2), a potent vasodilator and inhibitor of platelet aggregation. An imbalance of prostacyclin and its physiological antagonist thromboxane A2 contribute to the development of myocardial infarction, stroke, and atherosclerosis. Unlike most P450 enzymes, PGIS does not require molecular oxygen (O2). Instead it uses its heme cofactor to catalyze the isomerization of prostaglandin H2 to prostacyclin. 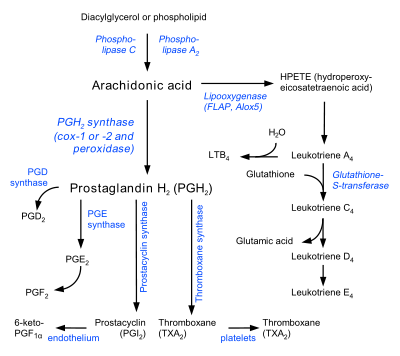 Prostaglandin H2 is produced by cyclooxygenase in the first committed step of prostaglandin biosynthesis. The systematic name of this enzyme class is (5Z,13E)-(15S)-9alpha,11alpha-epidioxy-15-hydroxyprosta-5,13-dienoate 6-isomerase. Other names in common use include prostacyclin synthase, prostacyclin synthetase, prostagladin I2 synthetase, PGI2 synthase, PGIS, PTGIS, and PGI2 synthetase. ↑ Yokoyama C, Yabuki T, Inoue H, Tone Y, Hara S, Hatae T, Nagata M, Takahashi EI, Tanabe T (September 1996). "Human gene encoding prostacyclin synthase (PTGIS): genomic organization, chromosomal localization, and promoter activity". Genomics. 36 (2): 296–304. doi:10.1006/geno.1996.0465. PMID 8812456. DeWitt DL, Smith WL (1983). "Purification of prostacyclin synthase from bovine aorta by immunoaffinity chromatography. Evidence that the enzyme is a hemoprotein". J. Biol. Chem. 258 (5): 3285–93. PMID 6338016. Ullrich V, Castle L, Weber P (1981). "Spectral evidence for the cytochrome P450 nature of prostacyclin synthetase". Biochem. Pharmacol. 30 (14): 2033–6. doi:10.1016/0006-2952(81)90218-5. PMID 7023490. Xie X, Ma YT, Fu ZY, et al. (2008). "[Study on the association of cyclooxygenase-2 -765g>C and prostacyclin synthase C1117A polymorphisms and the risk of myocardial infarction in Uigur population of Xinjiang, China]". Zhonghua Liu Xing Bing Xue Za Zhi. 29 (6): 598–603. PMID 19040046. Yoshida T, Kato K, Yokoi K, et al. (2009). "Association of genetic variants with chronic kidney disease in individuals with different lipid profiles.". Int. J. Mol. Med. 24 (2): 233–46. doi:10.3892/ijmm_00000226. PMID 19578796. Palmieri RT, Wilson MA, Iversen ES, et al. (2008). "Polymorphism in the IL18 gene and epithelial ovarian cancer in non-Hispanic white women.". Cancer Epidemiol. Biomarkers Prev. 17 (12): 3567–72. doi:10.1158/1055-9965.EPI-08-0548. PMC 2664299 . PMID 19064572. Mavaddat N, Dunning AM, Ponder BA, et al. (2009). "Common genetic variation in candidate genes and susceptibility to subtypes of breast cancer.". Cancer Epidemiol. Biomarkers Prev. 18 (1): 255–9. doi:10.1158/1055-9965.EPI-08-0704. PMC 2655077 . PMID 19124506. Xie X, Ma YT, Fu ZY, et al. (2009). "[Association of GLu461ALa polymorphism of prostacyclin synthase gene with myocardial infarction in Uigur population]". Zhonghua Yu Fang Yi Xue Za Zhi. 43 (3): 237–41. PMID 19534932. Dagle JM, Lepp NT, Cooper ME, et al. (2009). "Determination of genetic predisposition to patent ductus arteriosus in preterm infants.". Pediatrics. 123 (4): 1116–23. doi:10.1542/peds.2008-0313. PMC 2734952 . PMID 19336370. Xie X, Ma Y, Fu Z, et al. (2008). "[Association of polymorphism of the prostacyclin synthase gene with myocardial infarction in Uigur population of Xinjiang]". Zhonghua Yi Xue Yi Chuan Xue Za Zhi. 25 (6): 708–11. PMID 19065539. Nelson DR, Zeldin DC, Hoffman SM, et al. (2004). "Comparison of cytochrome P450 (CYP) genes from the mouse and human genomes, including nomenclature recommendations for genes, pseudogenes and alternative-splice variants.". Pharmacogenetics. 14 (1): 1–18. doi:10.1097/00008571-200401000-00001. PMID 15128046. Barbali M, Naranci NS, Skari-Juri T, et al. (2009). "A quantitative trait locus for SBP maps near KCNB1 and PTGIS in a population isolate.". Am. J. Hypertens. 22 (6): 663–8. doi:10.1038/ajh.2009.46. PMID 19265782. Xie X, Ma YT, Fu ZY, et al. (2009). "Association of polymorphisms of PTGS2 and CYP8A1 with myocardial infarction.". Clin. Chem. Lab. Med. 47 (3): 347–52. doi:10.1515/CCLM.2009.078. PMID 19327107. Abraham JE, Harrington P, Driver KE, et al. (2009). "Common polymorphisms in the prostaglandin pathway genes and their association with breast cancer susceptibility and survival.". Clin. Cancer Res. 15 (6): 2181–91. doi:10.1158/1078-0432.CCR-08-0716. PMID 19276290. Ruan KH, Wu J, Cervantes V (2008). "Characterization of the substrate mimic bound to engineered prostacyclin synthase in solution using high-resolution NMR spectroscopy and mutagenesis: implication of the molecular mechanism in biosynthesis of prostacyclin.". Biochemistry. 47 (2): 680–8. doi:10.1021/bi701671q. PMID 18081314. Hashimoto K, Ishibashi K, Gebretsadik T, et al. (2008). "Functional polymorphism of the promoter region of the prostacyclin synthase gene and severity of RSV infection in hospitalized children.". J. Med. Virol. 80 (11): 2015–22. doi:10.1002/jmv.21318. PMID 18814254. Xiang Xie; Ma YT; Fu ZY; et al. (2009). "Haplotype analysis of the CYP8A1 gene associated with myocardial infarction.". Clin. Appl. Thromb. Hemost. 15 (5): 574–80. doi:10.1177/1076029608329581. PMID 19147528. Lemaitre RN, Rice K, Marciante K, et al. (2009). "Variation in eicosanoid genes, non-fatal myocardial infarction and ischemic stroke.". Atherosclerosis. 204 (2): e58–63. doi:10.1016/j.atherosclerosis.2008.10.011. PMC 2753183 . PMID 19046748. Ito T, Okada T, Mimuro J, et al. (2007). "Adenoassociated virus-mediated prostacyclin synthase expression prevents pulmonary arterial hypertension in rats.". Hypertension. 50 (3): 531–6. doi:10.1161/HYPERTENSIONAHA.107.091348. PMID 17635855. Ma YT, Xie X, Fu ZY, et al. (2009). "[Haplotypes analysis of the prostacyclin synthase gene and myocardial infarction in Uigur population]". Zhonghua Xin Xue Guan Bing Za Zhi. 37 (2): 115–9. PMID 19719985. Yeh HC, Gerfen GJ, Wang JS, et al. (2009). "Characterization of the peroxidase mechanism upon reaction of prostacyclin synthase with peracetic acid. Identification of a tyrosyl radical intermediate.". Biochemistry. 48 (5): 917–28. doi:10.1021/bi801382v. PMC 2849756 . PMID 19187034. Young RP, Hopkins RJ, Hay BA, et al. (2009). "A gene-based risk score for lung cancer susceptibility in smokers and ex-smokers.". Postgrad Med J. 85 (1008): 515–24. doi:10.1136/pgmj.2008.077107. PMID 19789190.